Before I do my oil change before winter in the next few weeks, I want to check my valve clearances too. ( my first time). Before I do, I'd just like to verify a couple of things. I have a VS 1915cc - in the pic I attached, I'm thinking I'm supposed to line up the top dead center mark with the edge the blue arrow is pointing at, correct? (or is it the other side with the yellow arrow). Once lined up, the gap is supposed to be .006 for intake and exhaust? I've read that the belt is supposed to be kind of loose - you may have to squeeze the belt together to add some tension when moving the flywheel with the wrench. Mine is bar tight - it doesn't deflect at all when pushing on the belt. Should I loosen it, or should it be that tight? Does anybody have a recommendation for gaskets (with a link if you have one). I've read pros and cons about what gasket material is best, whether to use Permatex or not, etc - is there a general consensus with the folks here? Any tips I should know about? I'm also going to be changing the gear oil in the trans before winter. I do this in my 2000 Bug, and it's pretty straightforward - any tips or anything I should know about changing the gear oil in our Speedsters? Thank you for that link Art - appreciate it. Yes, you should be able to deflect the belt about 1/2"(?) when pushed in the middle between the 2 pulleys with a thumb. Make sure you know whether the pushrods are chromoly (adjusted to "loose 0- there should be no play but the pushrod will spin in between your forefinger and thumb) or aluminum (.006"). I've read that if you have a 2nd set of valve covers and a junk head (with bail), gluing the stock cork gaskets to the covers with (iIrc) contact cement or permatex makes them pretty leak-proof (and they won't move around). Make sure the car floor pan is close to level (front to back) when draining trans oil. It drains quickest when the oil is warm (just after a drive) and I've read to let the oil drain until there's 20 seconds between drops. From the Bentley manual- "If you attempt to fill the transmission too rapidly, the oil may overflow and give the impression that the case is already full. The manual transmission requires 5.3 U. S. pints (2.5 litres or 4.4 Imperial quarts)." Give it time to flow into all the nooks and crannies. The level should be up to the bottom of the fill plug, and don't forget to wipe the fur off the magnet on the drain plug before re-installing (make sure the drain plug gets fitted first!). Also from the manual- "The hypoid oil should always be changed 600 mi. (1,000 km) after rebuilding the transmission". Normally there is no need to change trans fluid more often than every 20-30,000 miles. The danger in overly tight belt tension is that it can prematurely wear out the bearings in the alternator. Thanks for the help guys - much appreciated! Are the push rods in a VS 1915cc typically aluminum? Is this the correct gasket for the 1915cc engine? I'm guessing that in a mild VS 1915 they're aluminum, but to check, take a magnet to the pushrod shaft. Or, when you pop the valve cover off- what are the clearances now? Measure and that will tell you which to set them at. Your engine is a 1600 with bigger pistons and cylinders so yes, those valve cover gaskets will fit. 1300/1500/1600 are all very similar engines, having a 69 mm crankshaft, and using a lot of the same (or similar) parts, including valve covers and their gaskets. If you don't already know- the 40 hp. 1200 is different (for starters, a 64 mm crankshaft, different rods, engine case, sheetmetal, and the list goes on) and the 25 and 36 hp. 1100/1200 is different again. PS- @Sacto Mitch said "The danger in overly tight belt tension is that it can will prematurely wear out the bearings in the alternator." For those wondering, that's why there has to be just a little bit of slack in the belt. Too much slack, the alternator won't charge all the time and the engine could possibly overheat (the fan is bolted to the end of the alternator). Thank you for all that info Al - knowledge that's routine for many here, is a godsend to someone without much mechanical ability that is trying to sort things out with their engine. Being new to air cooled only adds to the challenge - I'm just going go keep chipping away at the learning curve as best I can. Slowshoes---you are so right about the wealth of info here and willingness of the kind folks here to share their knowledge with the mechanically challenged---like me. I have really enjoyed my VS for 13 years thanks to the help I have rec'd here. You would be smart to get a copy of the book "How to keep your Volkswqgen Alive" by John Muir---great info and simple to understand trouble shooting and procedures. Welcome to the madness and best of luck to you! Just so you know where I'm at - I wouldn't know what to file on the points, or what to adjust after I did, lol. I bought an electronic ignition module to replace the points, but right now, I'm reluctant to mess with it. After replacing the garbage spark plug wires and putting in new plugs, my car is finally running like I envisioned it should run when I took delivery on it 15 months ago. Jack - thanks for that recommendation on Muir's book. I do own a copy - the only thing that's missing for me is actual photos of what he is describing. For me, the old saw about a picture being worth a thousand words really holds true. That being said, it's definitely been helpful. Thanks again for all the help fellas. There actually is a file especially made for filing points, but it is an all but forgotten art. As the points are making and breaking contact, they are turning the coil on and off at specific intervals. When the points open, the coil primary side ( the wire that goes from the distributor to the coil ) gets a big shot of instantaneous voltage generated by the energized coil - like, maybe, 500 volts, or so, for just an instant. That much voltage causes an arc across the points. To keep the points from arcing and burning from that much voltage, a capacitor is used to “charge” and absorb some of the voltage, putting the points at zero voltage when opening and closing - THAT is what a condenser does. Usually, a condenser either works or it doesn’t and while they can break down over time, one minute the engine is running and next minute it’s stopped because of condenser failure. If the condenser fails, usually the points are fried by being either welded together or burned so badly they can’t make contact anymore. When that happens, pop in a new set of points and a new condenser, adjust the point gap at wide open (the thickness of a common matchbook usually works pretty well in a pinch) and you’re good to go. Now, about filing them. First you have to know if they are good enough to file, ie; are they pitted so much that filing won’t help, like having a big peak on one side and a crater on the other (a sure sign of a failing condenser). Next, you need to file them perfectly parallel, which is best done in a vice, although I have had OK luck by doing them in my hand on the side of the road. Lastly, filed points are just a stop-gap and don’t last nearly as long as new points. The old points failed because the condenser was not exactly the correct capacitance value for your coil or had changed capacitance value over time as it weakened - they make a tuned circuit together and when they’re not in tune it causes point pitting (burning). Installing BOTH points and condenser at the same time will work fine 90% of the time. Good ( read that, OLD ) mechanics can tell if you have the right condenser value for your coil just by looking at the points, but us “Auld Pharts” are a dieing breed, these days. Just pop in both points and condenser, adjust the point gap as your service manual or the Bob and Dave VW page instructs you ( it’s not as hard as it sounds ) and you should be fine. The old adage was new points/condenser every 12-24,000 miles, depending on car, but I’ve seen them last for 50,000 miles, too, if they are both perfect for each other. More great information, as is your usual (and yet another post saved to my Speedster file!). So when switching over to an electronic ignition, then condenser goes away, correct? Is it better to change out the points and condenser to a schedule, even if the car is running fine? Once the points (or the electronic ignition) are changed, do you need to readjust the timing or adjust the carbs? I don't know how to do either of these procedures either (I know, shocking ). I have been watching videos to try and get a handle on things - is there any recommendations for a timing light, or is a timing light a timing light, and there really isn't a better one to have. I've tried messing with carbs on small engines, and I've never had any success getting the engines to run correctly (and I mean never, as in 0%), so I'll be very reluctant to do anything with the carbs. There's a local tech session on VW aircooled coming up locally. It's only one day, but I'd love to attend. I rsvp'd, telling them I'm a novice - they never said anything about how much knowledge they'd like you to have as a starting point - still haven't heard back yet. We just have some new windows installed a bit ago - I was in the garage finishing up the plug wire and plug install when the installers pulled up in the drive. Turns out that both installers are car guys, and one of them has a sand rail with a 1915cc engine! He gave me a name and number of the mechanic he uses for his sand rail, so if nothing else, I've got a line on someone else who may be able to help out should I muck something up. Thanks again for all the great info Gordon. Bill, you’re in the same carburetor predicament as my “Tuner” son - He thinks all carburetors work on some principle of Black Magic. And since they haven’t been used on most cars since something like 1983, knowing how to set them up and keep them happy is a dieing art, too. ”Is it better to change out the points and condenser to a schedule, even if the car is running fine? ”. Usually I say, “If it’s running fine, don’t mess with it”, but if you live in a very humid area (shore/lake side or something) you might consider replacing them at 12K intervals, just because of corrosion, but again.....If it’s running fine I would leave it alone. 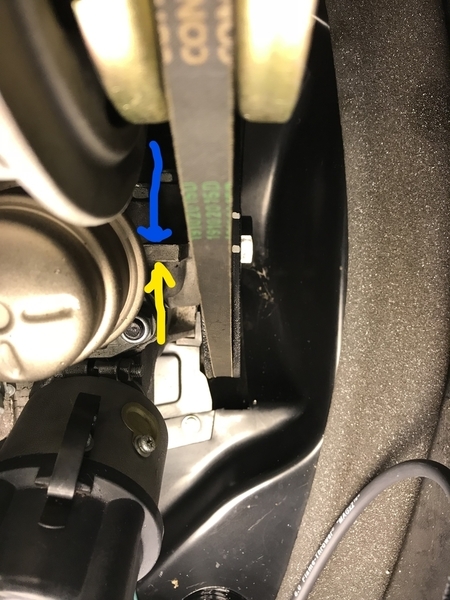 If you install an electronic ignition module, the condenser is not used and unless the distributor is removed or rotated during the swap (both unlikely in your case) the timing will be unchanged. The Carbs won’t need to be adjusted for anything, either. Just remove the old points and condenser, drop in the electronic module per the enclosed instructions and you’re done. Timing light: handy little buggers. You want one with an inductive pickup. It looks like a giant clothes pin that clamps around the #1 plug wire anywhere alongs it’s length. Other than that, I have one that runs on 2 “D” batteries so I don’t have to find +12 volts back there for the light and it about the size of a flashlight - Handy in the small space near the pulley. Local aircooled resources are like gold these days. Interview them like they will be your doctor and go with the ones your comfortable with. When I put the Pertronix module in Bridget back in the day I did have to reset the timing. Had to turn the distributer about 20 degrees to get the car to run. After that I didn't have to touch it again. Later I found out that this is common with the Pertronix igniter. There has to be some black magic going on with carburetors - there doesn't isn't any other reasonable explanation. So if I drop the electronic ignition in place and the car starts running lousy, that's when I pull out the timing light and attempt to set the timing, right? Does resetting the timing often lead to having to tweek the carbs too - that would be a slippery slope for me. In a worst case scenario, could I just put the points and condenser back on and the car would run fine again? To get to an air cooled mechanic is an hour drive for me, so I can't have the car coughing and sputtering. BUT! As you said....If you mess something up you're dead in the water and getting to that mechanic an hour away might become really difficult. I would live with your current points (you did say that it's running well right now) and hold on to the Pretronix gizmo until your next visit with the mechanic and ask to watch while they swap them out, just to see how it's done. THAT way, he'll install it and check the timing (because you'll ask him/her to) and you'll see how that is done, too. It only takes a half-hour to swap them and would be a good learning experience. Great suggestions Gordon - I'm going to do just that. The car is running better than it ever has - it's really amazing what a difference the new plug wires and plugs made. We've had some great drives since replacing them - with highs in the 80's, it felt like summer too. Now, we are back to reality with highs in the 50's - still doable, but we'll have to bundle up a bit!. Hi - Would you mind sharing the brand/model of plugs and wires you're now using and where you got them? I'm no electrician, but I've done plenty of 12v wiring aboard my various boats over my lifetime, and I can tell you, the spark plug ends on my old wires were cobbled together junk. At any rate, I replaced the 7mm bosch wires with Pertronix 8042 8mm Flamethrower wires and the Bosch WR8AC plugs with NGK BR5HS plugs. I used practically every suggestion I got on that spark plug thread ( plus some tool advice from Gordon from a search) - without all that great advice, I'd probably still be out in the garage trying to get the job done! Great thread, lots of good info. Most everything I thought of is covered, I just wanted to add my 2¢ on valve cover gaskets. I get almost no leakage using this method. First, make sure your valve covers are straight. The stock type work just fine if they're straight. If you ever decide to go aluminum, get the type that work with wire bails, they keep constant pressure on the gasket and are immune to vibration. Next, I've had my best luck with FelPro cork gaskets from my local auto parts. Use Permatex copper on the valve cover side only. I didn't have a spare set of heads to compress the gaskets into the cover while the Permatex cures, so I made a set of fitted cutouts from some 3/4" MDF (medium density fiberboard) I had lying around. Any wood will work, as long as it's flat. Lay a thin bead of Permatex on the clean valve cover, gently press the cork gasket into it, wrap the wooden cutouts with saran wrap so excess Permatex doesn't stick, then gently clamp them to the valve cover, making sure the gasket doesn't slide or deform. Wait several hours for the Permatex to cure. Finally, remove the clamps and wood cutouts after the Permatex is set. When you're ready to install the covers, work a thin coating of axle grease into the head side of the gaskets, then place each one on its head and secure with the wire bail. Try to get the valve cover centered side-to side before snapping the bail on with a screwdriver. If possible, let the engine sit for a few hours to give the cork time to set. Then take it out for nice long drive, long enough for the heads and oil to run at full operating temperature for at least 30 minutes. Bring it home and park it level. Check for leaks the next morning, but I doubt you'll find any. The next time you have to pull the valve covers, they should come right off without sticking. If the mating surface is intact, you can reuse the gaskets. Carefully wipe the mating surface of the heads, the insides of the valve covers, and the gaskets themselves clean of engine oil with a shop towel, then re-coat the gaskets with axle grease before assembly. Thanks for the info on gaskets Eric. I've found folks who use no sealer at all on the gaskets, others that use Permatex on both sides of the gasket, and others still that do as you do, and use Permatex on the valve cover side, and grease on the head side of the gaskets. I'm going to do as you do and use grease on the head side of the gasket - I have visions of the gasket welding itself to the head, and having to scrape the gasket material off the head when checking the valves in the future. I'm falling a bit behind due to a health issue (damn gout), but I managed to get the oil changed in the bug and Speedster today. We're having family come to visit over the next few days, but I may try to get out there and check the valves tomorrow before folks start arriving. Took the speedster out for a drive to warm it up before changing the oil - temp outside was 41 when I left - winter is on the way. (baseball cap, two light coats, driving gloves, shorts and the blow torch of a heater our cars have on high!) Stylin' and warm enough. I have used both the full cork versions, as well as the black, composite versions. Both seem to work equally well when I slick them up on both sides with plain old automotive grease so I have a thick film on both sides. Then I hang them somewhere for an hour or so to let the grease soak in a bit to get them moist, then just wipe off the excess grease and install them. I also have the aluminum, bolt-on, CB Performance valve covers that are supposed to leak. They don't. I aways make up new o-rings for the bolts using rubber, 5/16" ID fuel hose cut to about 1/4" thick and everything seals up just fine for me. Does the type of grease matter? What you’re trying to do is get the gasket material moist such that it swells just a little bit. Once it swells from the grease, you assemble as normal and the gasket compresses a bit and seals up, just as it was designed to do. Easy-Peasy.